Soon after I heard about the march, I not only planned to go, but started working on a design for a t-shirt and sign. 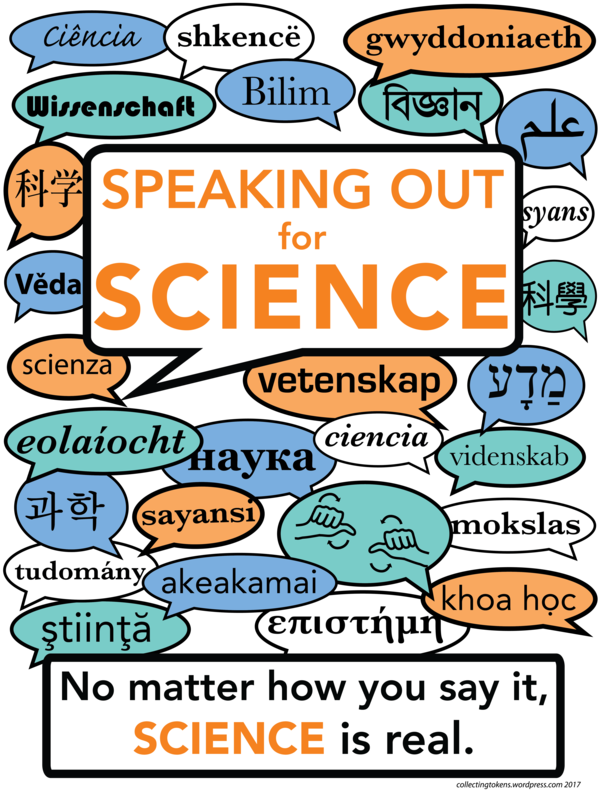 As I am a linguist, I wanted to represent speech and language sciences. 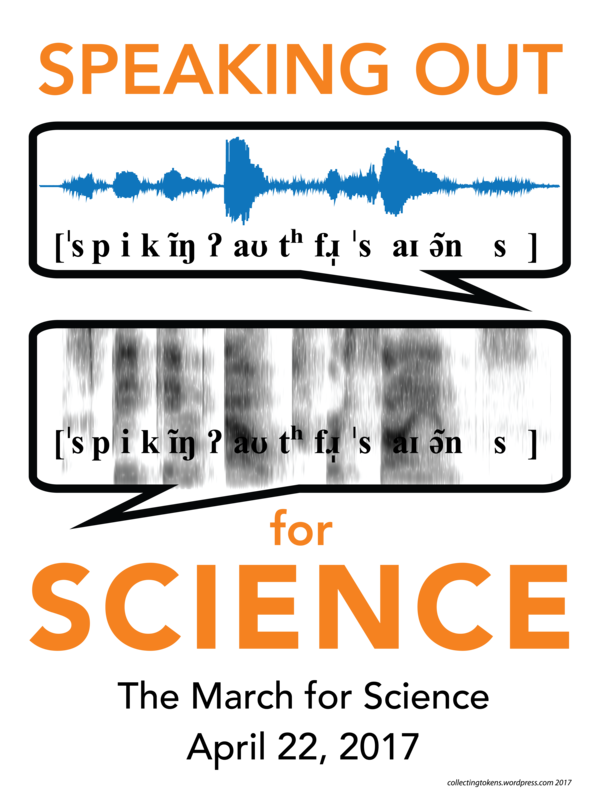 I made a recording of myself saying my slogan, “speaking out for science,” and put together a graphic with the (orthographic) text, a waveform, and a phonetic transcription in IPA. I put up a draft of my design on Facebook, and got some feedback from other linguists on my transcription. I made a new recording with some clearer articulation, and put up a new image and transcription. 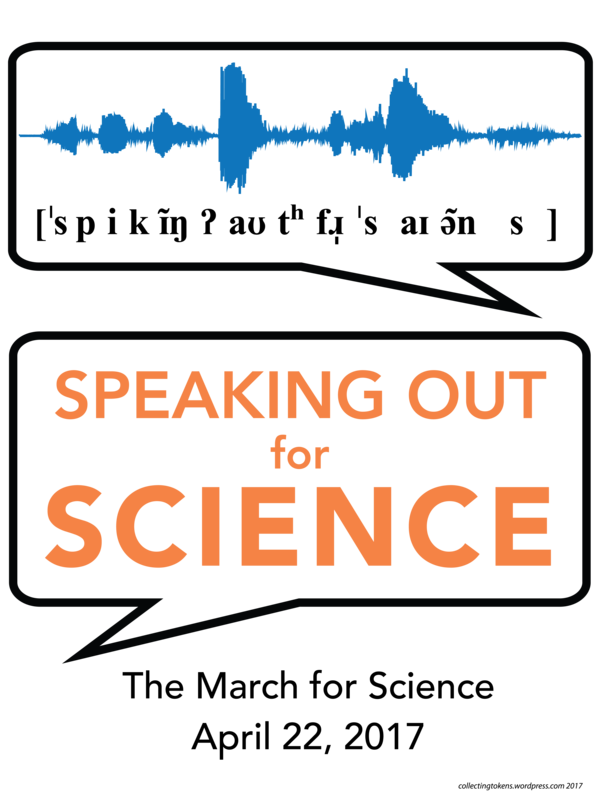 I finalized a couple versions of my design (one with a spectrogram), and set up a storefront on TeePublic (an online t-shirt store), and lo and behold, several people ordered shirts! While I admittedly at first felt a bit deflated to have the design I’d made for fun get feedback that felt harsher than what I’ve seen from anonymous reviewers on a conference abstract, I realized that there was an opening for a new variation on the design. Because this is what scientists do. We discuss our methods and our data with our peers, and we revise accordingly. And so it is that I have 4 different design variations. I have put together some files that are available for downloading and printing, free for personal use, should anyone else want to use them. (I’m planning on making a couple of two-sided signs, each with 2 of the different designs.) Variations of the designs are also available on t-shirts and on some other stuff on TeePublic. 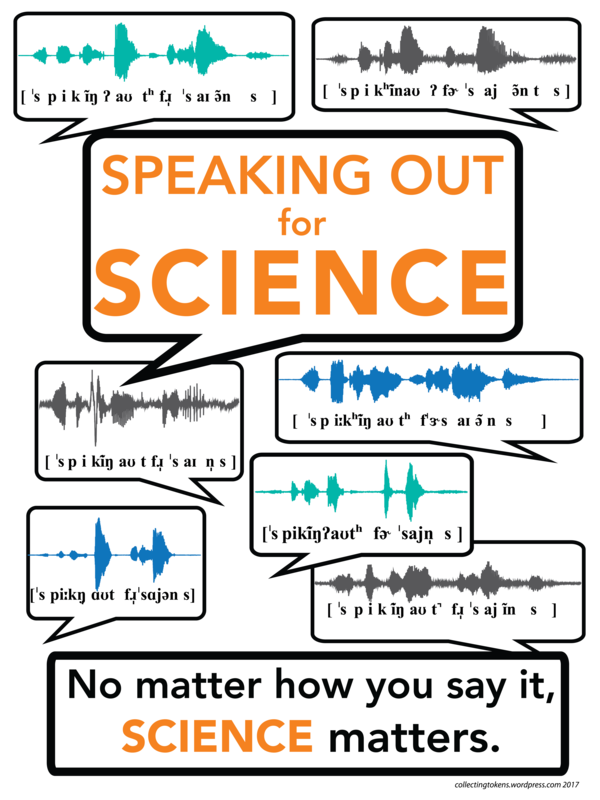 Below are the files, formatted for printing on 18″x 24″ (but scaleable). The png files have a transparent background. 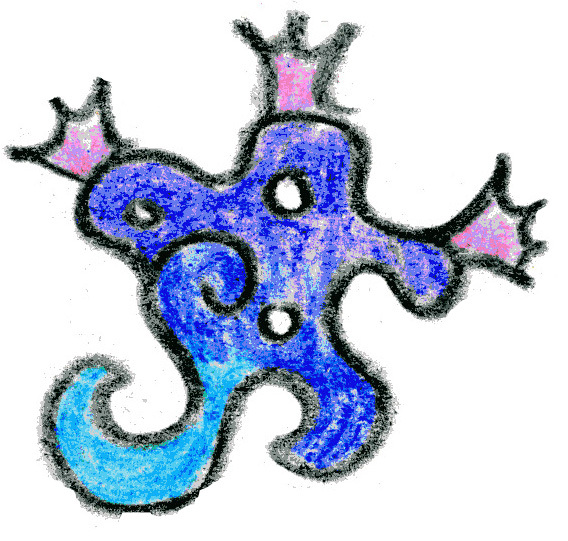 Images were created using Praat and Illustrator. Let me know if you decide to use one of my signs. And let me know if you have any suggestions for future versions! (Help me get more voices and more languages. For science!) You can always email me at alejna99 “at” gmail.com. Edited 4/18/2017: I have updated the pdf and png files to hopefully fix font issues that may come up on different computers. Please do let me know if you run into problems with any of the files! We wear hoodies in our family, all 4 of us. I am the mother of 2 young children, one a little boy. 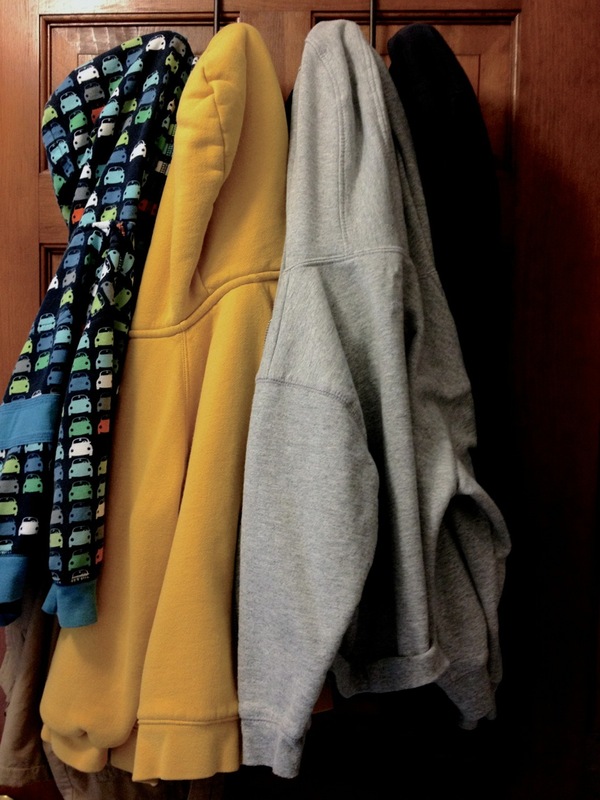 He probably has more hoodies than the rest of us, in a range of colors. He even has a gray hoodie, one that we got during our visit to my husband’s high school for a reunion a few months ago. Each day when we send him to his pre-K class, we have to send him in with a sweater or sweatshirt. Even on hot summer days, since New England weather can turn quickly, or the air conditioning inside can be excessive. This past week, I have found myself consciously avoiding that gray hoodie. I see it hanging there on the hook on the back of a door, along with the yellow hoodie and the blue one with the prints of cars. I look at that little gray hoodie, and my heart hurts. I can’t even bear the thought of posting a photo of my little boy in his gray hoodie, because of the association with the vulnerability of being a target. Because of the association with a boy who lost his life, and a mother who lost her child. One day my little boy will be the same age as Trayvon Martin was that night last year. He will be a teenage boy, with the range of moods and sometimes unpredictable behavior that come with that stage. He may be an honor student, or a rebel, or a little of each. He may choose to behave exactly as Trayvon did, buy the same candy and sugary drink. Want to walk out in the rain to get away from adult company. He may be the same height and build as Trayvon. He may choose to dress exactly as Trayvon did. And yet I also know that he will never be a target in the same way that Trayvon Martin was. The privilege of white skin will give him license to wear that hoodie, to walk in an unfamiliar neighborhood, to shop in a store, without being profiled by default as a potential threat. The discourse of the past 2 weeks reminds me of the privilege that I have and that my family has. The fact that I can be reminded of my privilege is itself a hallmark of privilege: I have the luxury to be able to regularly forget. Where I live, I can drive around my town, I can walk through my neighborhood, shop in any store, without once wondering if the color of my skin will attract negative attention. I know that I don’t entirely fit in where I live, and my hairstyle and clothes mark me as a bit different. But never in a threatening way. I can dress like a slob without worrying that it reflects badly on my heritage. I can drive a nice car without raising any eyebrows, or drive a beat-up car without people assuming that I am poor. As a white female, people make lots of assumptions about me, which may or may not in any way reflect who I am. But none of the assumptions put me at higher risk of being stopped by the police, or worse, someone like Zimmerman: highly armed but poorly trained, full of anger and self-righteousness and fear. I have been feeling heartsick since Zimmerman’s acquittal. The messages I read from that verdict and some of the ensuing discourse just drive home to me how far our society has yet to go to achieve equality. I have the sense that this country is divided: those who see the systemic inequity and the harmful biases, and those who are unwilling or unable to see them. I know that I live in a society that continues to have systemic racism. I am ashamed to sometimes see evidence of that racism in my own thoughts, my own assumptions. Much as I sometimes find my thoughts reflecting sexism, ablism, agism, classism and so many of the other isms that are part of our society. But I call myself out. Sometimes I even have the courage to call out others when I see it. I have had conversations with close friends and family members, and feel lucky that those closest to me see things much as I do. But I am realizing that these private conversations with like-minded people are not enough. I need to make a public stand, even if in my small way, by writing here. I know that people who are blind to what I see, to both systemic racism and the privilege that allows them that blindness, are not necessarily bad people. I know people, some of them even friends or family members, who fit into these categories. Even thinking about starting conversations with them about race and privilege exhausts me. But I am thinking about these things, and with this post, I am showing that I am willing to be part of this conversation. I have been reading posts and articles every day since the news of Zimmerman’s acquittal. I have spent a lot of time reflecting. I have felt outrage and deep sadness, but also great hope that this conversation will continue, and will bring progress. I am busy and am protective of the time I need to spend on my work and family obligations. However, this conversation is too important to me. I need to be part of the conversation because I want my children to grow up in a world where no child’s life is cut short by others’ assumptions about race. I want to live in a world where a mother’s worries about her son’s choice to wear a hoodie when he goes out on a walk will never be about anything more weighty than whether that hoodie will be warm enough. Walk this way, by Arnebya of What Now and Why: This was one of the BlogHer Voices of the Year posts read at BlogHer in New York last summer, and I was lucky enough to be in the audience for the author’s powerful reading. White Privilege: Unpacking the Invisible Knapsack, by Peggy McIntosh. This was written in 1990, but it is still sadly quite up to date. We are not Trayvon Martin: this is a Tumblr where individuals can submit their stories. It was started on July 15th, and already has over a thousand posts. I have not read all of them, but I have visited and read several posts every day. Seeing so many stories, so many people lending their voices to the discussion, gives me hope. If you have written things about these topics yourself, or read things that moved you, please feel free to share links in the comments. 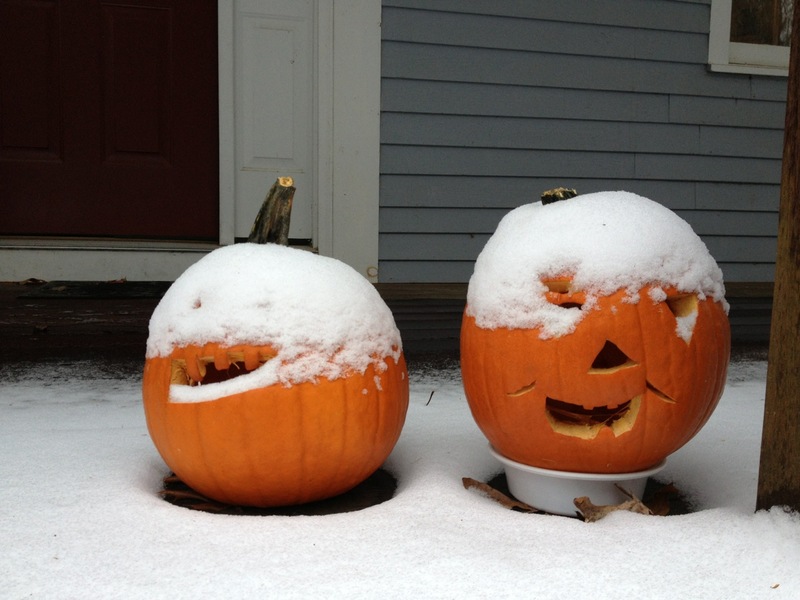 We had a our first snowfall of the season last night. 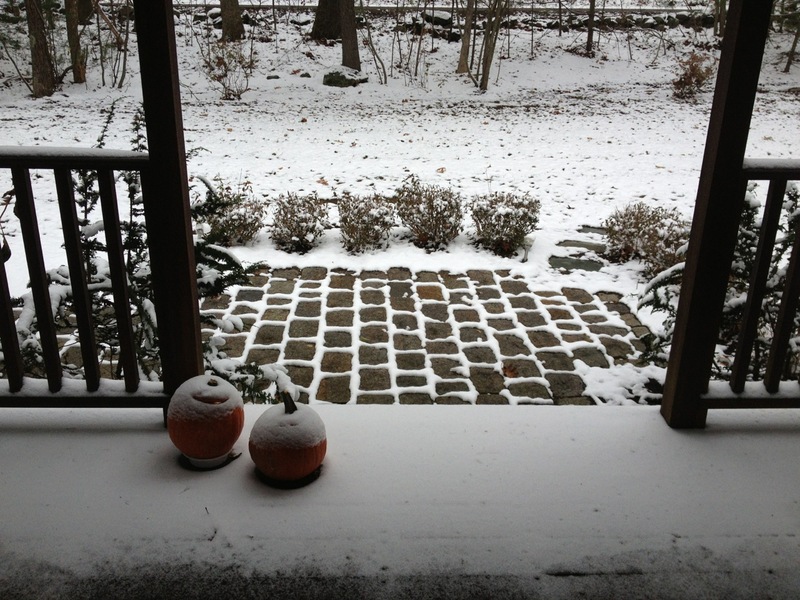 It didn’t amount to much accumulation, but it did make the roads treacherous, especially once darkness fell. This morning, though, it looked pretty. 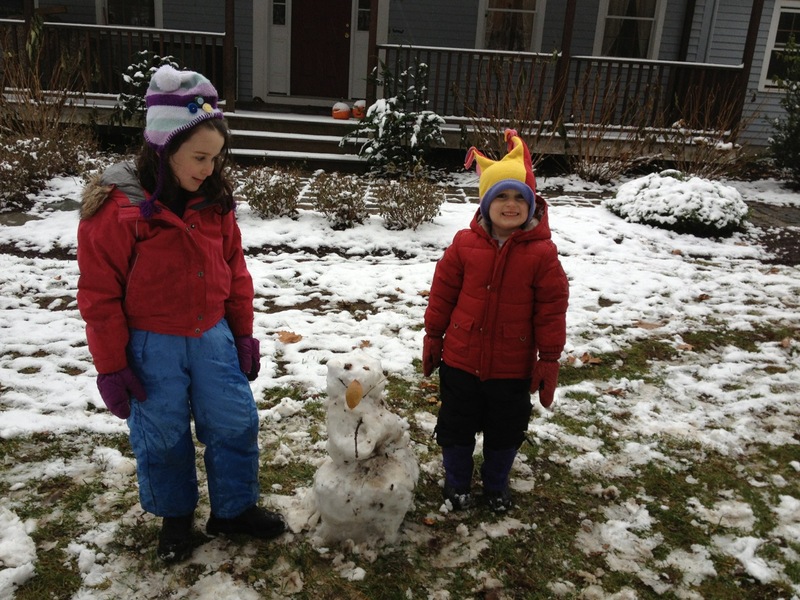 Phoebe and Theo were eager to go out and play in the snow. Phoebe still had to catch school bus, but I told them that if they were really fast getting ready and eating breakfast, they could play outside. They were remarkably fast (even though Theo tried to convince me that he’d be faster finishing breakfast if he didn’t have to eat any food), and I got their warm weather gear sorted out with unexpected speed as well. 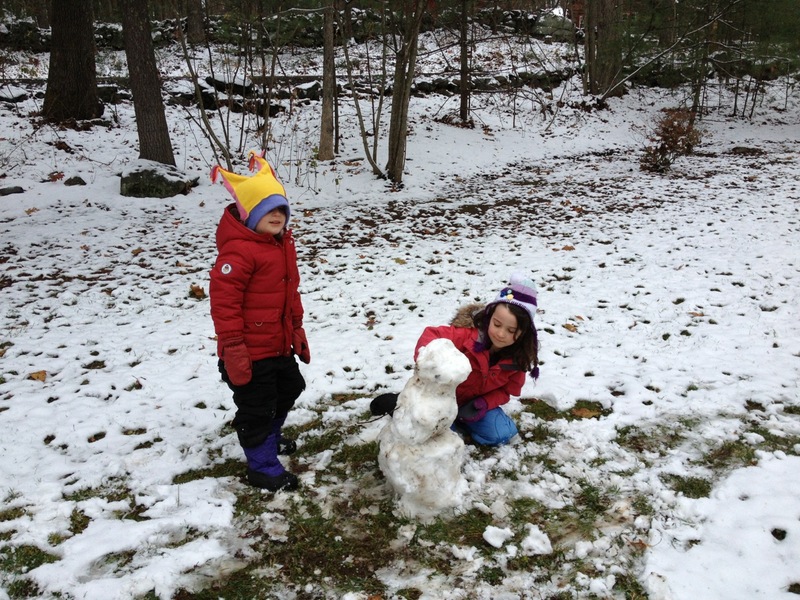 They had worked together, they were still working together, to build a snowman. They were discussing what they would use to make the face and other details, and, here’s the part that gets me, they weren’t bickering. My heart just about melted right there. 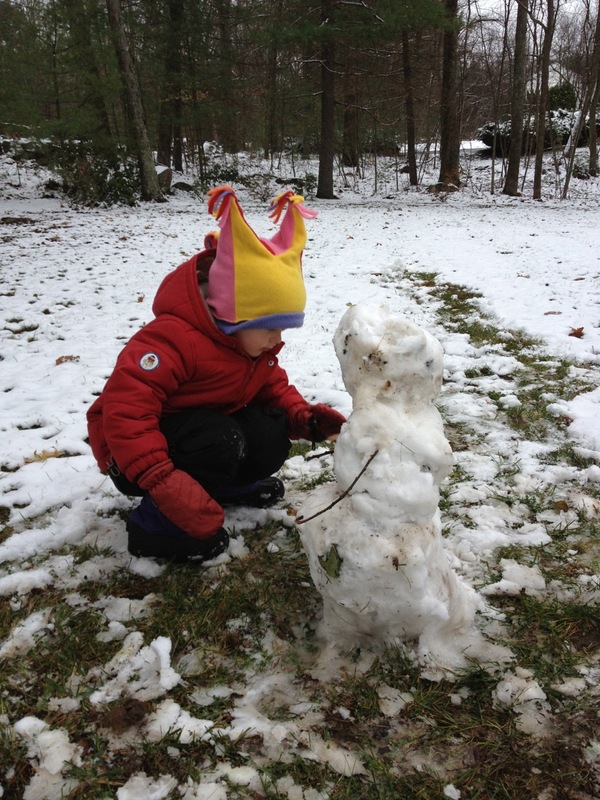 I had helped a bit with getting a few of the items to stick into the snowman, since I didn’t want them taking off their mittens. My hands got cold quickly. Even after I put my own gloves on, my hands stayed cold. Waiting around the few more minutes for the bus, I got colder in the wind and sleet, in spite of my warm coat, boots, hat and gloves. Phoebe got on the bus, and I drove Theo to preschool and came back home. My hands were still icy. I made some hot tea and warmed my hands on the mug and enjoyed the warmth of our house. And I just couldn’t stop thinking about the people who were hit so hard by Hurricane Sandy, such a short distance from me. All those people without electricity, many without heat or the ability to cook food in their homes. Many without homes. I thought of them in the dark and the wind and the wet and thought how much some of them must really, at that moment, just want to be warm. So much need. The need for shovels and trashbags and cleaning supplies is a reminder of how much work there is to be done. The need for diapers highlights to me how there must be many families with small children, dealing with darkness and cold and wetness and inadequate food and water sources, and the uncertainty of how long this will go on. I also checked out the Occupy Sandy Relief NYC Facebook page, where they have been posting frequent updates. It warmed my heart to see their activity, calling for volunteers to help with specific tasks, like delivering hot meals that someone had donated to homebound senior citizens in the Rockaways. I’d like to say thank you to all of you who are helping in the storm relief. May your hands stay as warm as your hearts. ¹ I think back to the angry right-wing types who characterized the Occupy protesters as lazy and greedy, and wonder if they will eat their words. I doubt it, though. They’re too busy demonizing someone else. COLD HANDS, WARM HEART – “A reserved, cool exterior may disguise a kind heart. The proverb has been traced back to ‘Collectanea by V.S. Lean. First cited in the United States in ‘Blue Murder’ by E. Snell.” From “Random House Dictionary of Popular Proverbs and Sayings” by Gregory Y. Titelman (Random House, New York, 1996). I also came across an interesting behavioral study showing that people are more likely to be generous and think positively of others when they have warm hands than when they have cold. Something to think about. So everybody go put on your mittens or hold a hot beverage, and make some donations. 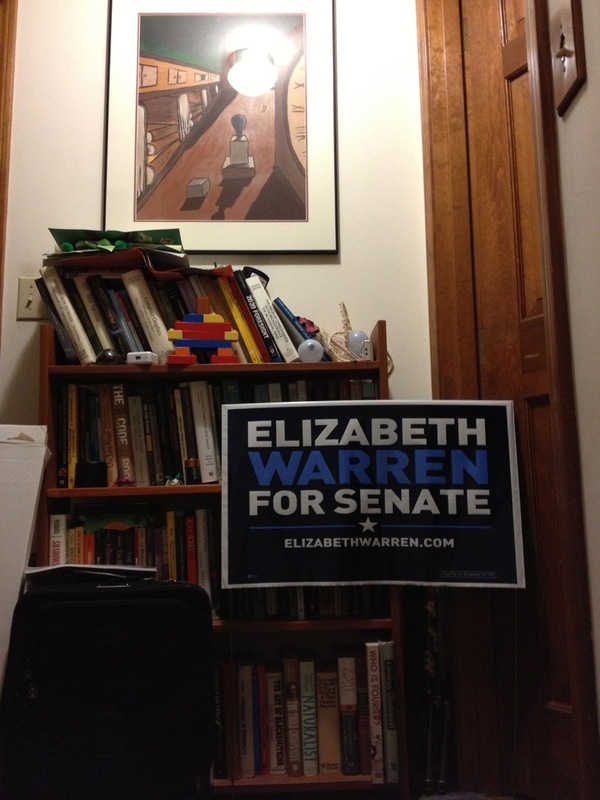 I have been marginally involved with the Elizabeth Warren campaign. 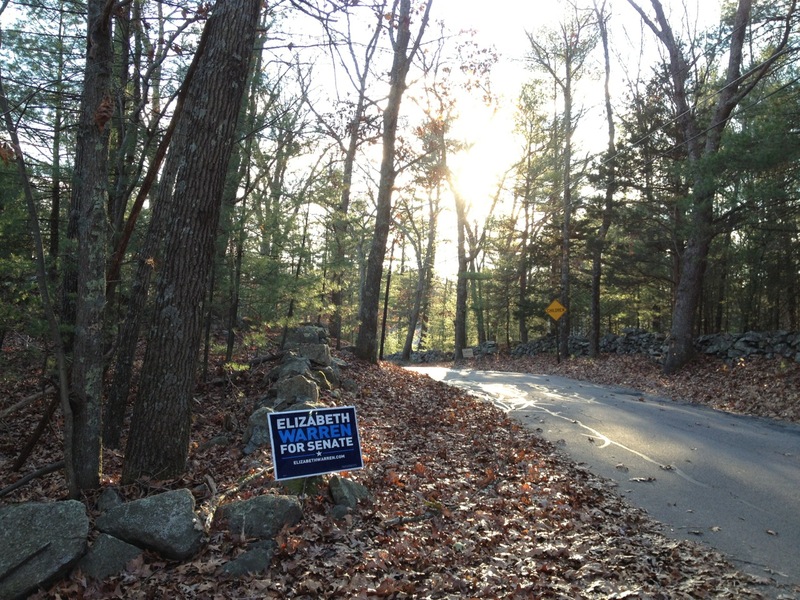 I did a very small bit of phone banking, and an afternoon of door-to-door canvassing. And I signed up to put up a yard sign. This may seem like no big deal, but it actually was a bit of a deal. Perhaps a medium-sized deal. We’ve never had a yard sign up before. 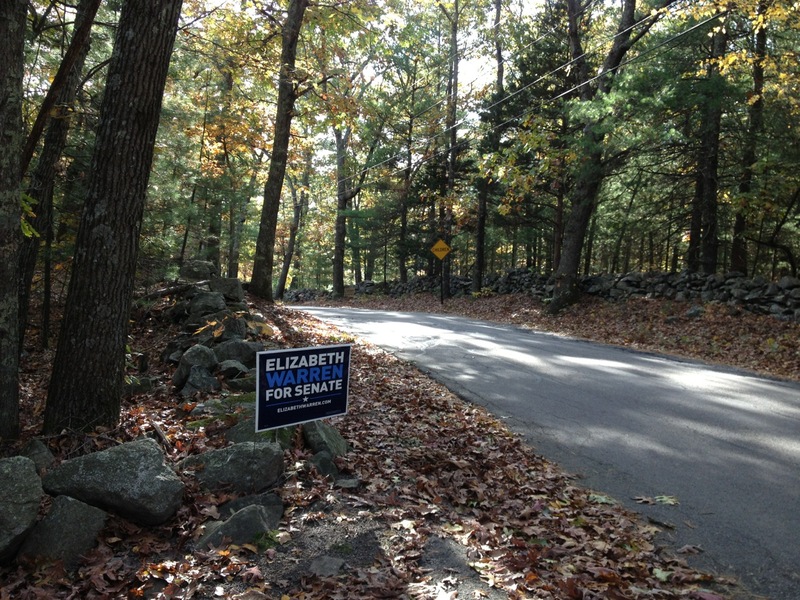 We support candidates in a variety of ways, but not typically with signs. One issue is that we are non-confrontational, and somewhat private. Anyone who knows me well knows how I lean politically. But it has generally not been the case that people who don’t know me well would necessarily know. But, it also publicly marks us. And in these rather ugly times, with so much open hostility surfacing with election, that’s not always a comfortable feeling. One afternoon, while I waited at the top of our driveway for Phoebe’s school bus, I noticed someone giving me a dirty look as he drove by. In the next day or so, our sign disappeared. Coincidence? John’s response was to order 2 new signs. A few weeks later, we had a sign back up in the yard. The 2nd new sign was kept as a back-up, in case the new sign also disappearead. I’m happy to say that our current sign has weathered both the ravages of weather and hostile neighbors. We have not needed to break out the emergency back-up sign. 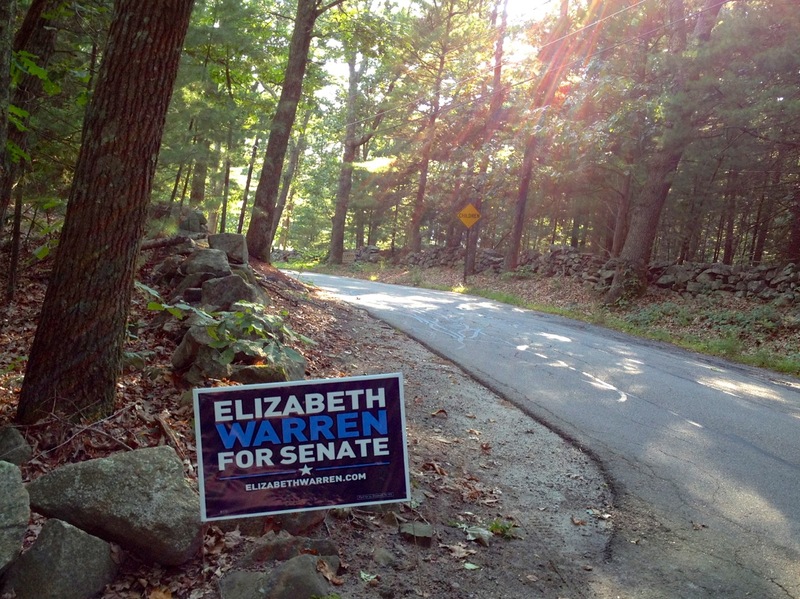 Here is our first sign, in early September, shortly before the sign’s disappearance. Note the green leaves on the trees. Here is the replacement sign, several weeks later. Here’s the sign again, just this afternoon. Still there! And check out all the leaves, none of which remain on the trees. Here is our back-up sign, at the top of the stairs, in front of a bookcase. Note the lack of leaves, but the presence of a Duplo robot and some light bulbs. 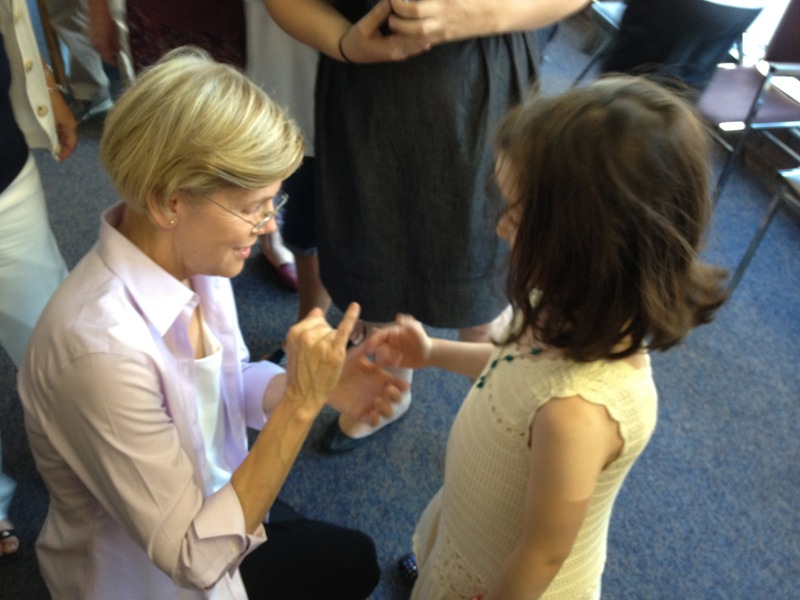 Phoebe and I also got to meet Elizabeth Warren at an event at her Worcester campaign office, which was enormously exciting for me. 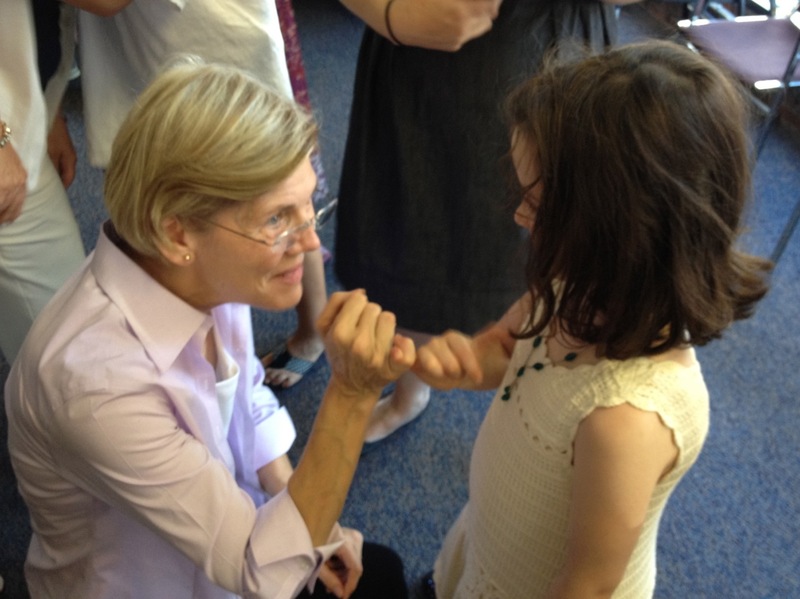 I was more than a little star-struck, but Ms. Warren was gracious and kind, and spent several minutes talking with Phoebe. Here they are doing a pinky promise. ¹ Especially you poor souls in swing states. ² I concede that Scott Brown has turned out to have been not as extreme as I feared, and has even occasionally broken with his party in his voting. However, he still by and large doesn’t represent me and my views. But I don’t want this post to be about him. Welcome to the September 2010 Just Posts, the latest edition of a monthly roundtable of posts on a range of topics relating to activism and social justice hosted here and at Cold Spaghetti. Please show your support and check out the great posts on the list below! It gets better. by Erika of Be gay about it. 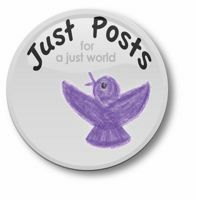 If you have a post in the list above, or would just like to support the Just Posts, we invite you to display a button on your blog with a link back here, or to the Just Posts at Cold Spaghetti. 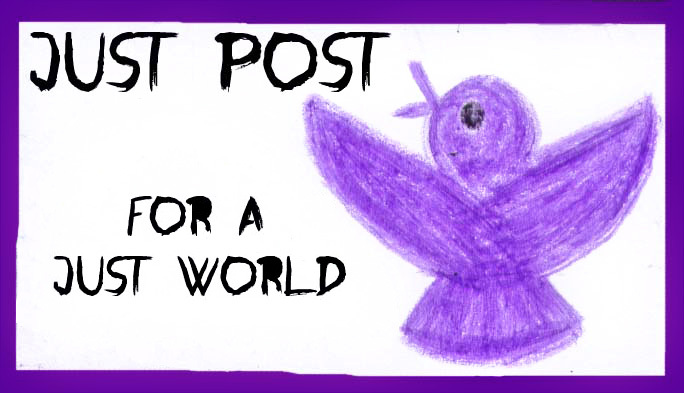 If you would like to have a post included next month, you can find out how to submit posts and all sorts of other stuff about the Just Posts at the information page.